Lots of leafy greens last week, yet still tons of variety. For new members – we hope garlic scapes proved to be a delightful new treat; returning members hopefully rejoiced in seeing them again. Scapes are only available for a very short window – its likely we won’t see any more this year. As the season progresses the variety in share contents will become even more pronounced. We want to thank our volunteers and site supervisors last week for a job well done! We are still looking for some high school volunteers if you know any teens with a service commitment to fill. To those with milk (goat or cow) or egg shares: please bring your [rinsed] milk jars back, as well as your empty egg cartons, so Goodale can re-use them. Please remember to sign in! Occasionally a volunteer is distracted and forgets to insist, please try to remember yourself. And please let us know if you can’t pick up your share. We will do our best to work out a plan for an alternate pick up time for you, but even if you definitely are forefiting, please just drop a line (email, text, phone call, Facebook message, etc). Also if you notice anyone wander in off the street looking to buy vegetables, please direct them to the shift coordinator or to the volunteer table where we have flyers explaining what the CSA is, and how we work. If you are volunteering this week, it is absolutely essential that you read the volunteer directions below. The directions are slightly different than last year, so even seasoned members need to read! ​​Even if you are not volunteering this week, it is a good idea to become familiar with them so you understand exactly what’s going on. On Saturday July 8th, our members have been invited to an exclusive tour of the farm at Queens Botanical Garden. We know many members simply cannot make it out to Golden Earthworm, so this is a great opportunity to see a working farm right here in Flushing. We will have a sign-up sheet closer to July 8. Napa Cabbage – Napa Cabbage is a mild-tasting Chinese cabbage that differs from a more common red or green cabbage in it’s elongated shape, ruffled leaves, and wide white stems. Napa Cabbage is high in Vitamins A and C, as wells as potassium and calcium. Napa cabbage is great raw, in Asian slaws and commonly used in kimchi, an Asian fermented dish. If you don’t think you don’t like cabbage, try this in a salad. I think you’ll love it! Storage: In an airtight (plastic) bag in the refrigerator. Uses: Raw, Cooked.When to use: Within 5 days. Green Kohlrabi – A member of the cabbage family, this funny looking veg needs to be peeled. Inside it’s crunchy and delicious raw in a salad or slaw, or cooked in stir fries and soups. Very versatile! Storage: In an airtight (plastic) bag in the refrigerator. Uses: Raw or cooked.When to use: Within 5 days. Cilantro – This herb adds wonderful flavor to soups, salads and sauces! Too much cilantro to use right now? Freeze it! Spinach – This is the next planting, so it is extremely tender. Best eaten raw in a salad. Storage: In an airtight (plastic) bag in the refrigerator. Uses: Raw is best, or gently wilted. When to use: Within 3 days. 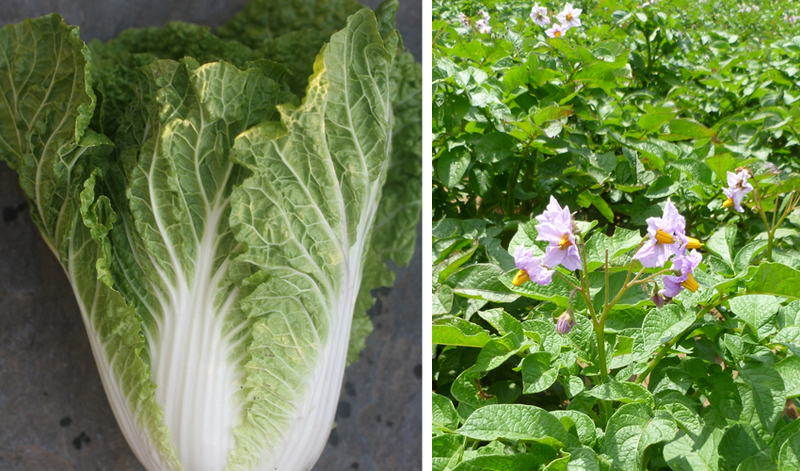 Bok Choi OR Japanese Salad Turnips – You will receive one OR the other….these items are currently in rotation. The turnips don’t need to be peeled and the greens are delicious too! On the bok choi, both the stalk and the leaves can be eaten raw, or cooked. Whether they’re stir-fried, gently steamed or added to soup, Bok Choi is easy to prepare and a nutritious addition to meals. Separate the leaves from the stalks, as the thicker stalks take longer to cook. Rinse well and drain, then shred or cut across the leaves, and cut stalks into small slices along the diagonal, saute with a small amount of water or chicken stock. Green Romaine Lettuce – The Romaine lettuce loves the hot weather. It’s crunchy and holds up well to heavier dressings and toppings. Perfect for Caesar salads. Storage: In an airtight (plastic) bag in the refrigerator. Uses: Raw in a salad.When to use: Within a week. Toscano OR Red Kale – Perhaps the most nutrient dense and versatile green? Yes! This one is great for kale chips, soups, thrown in smoothies, anything and everything! Previous Flushing CSA (Week 3)! Next Flushing CSA (Week 5)!